Choosing a mattress has become a confusing and time-consuming process with so many different brands and beds out there with so many similar features. However, a local company is changing all of that, making online ordering, front door delivery and one-style-fits-all the new, simpler standard. Sloom is a South African Mattress brand established in 2016 with the main goal of simplifying the mattress buying experience with an adjustable comfort mattress designed for all types of sleepers. A product designed to eliminate the confusion and frustration of commission driven, high markup beds in the South African Market. As an online exclusive sleep company, Sloom sells directly to consumers with products being delivered to your door in an easy-to-handle sized box. South Africa’s first comfort-adjustable mattress-in-a-box was developed by Rudo Kemp, founder of Sloom, after getting tired of selling mass-produced bed brands in a brick-and-mortar store. 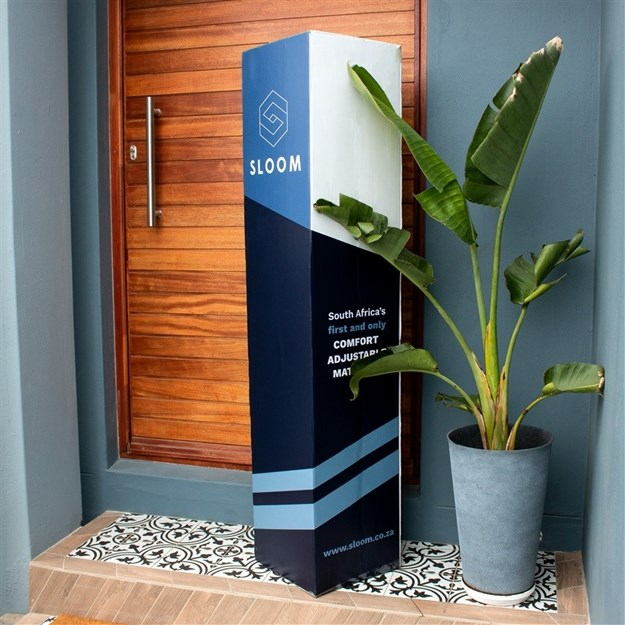 Using a state-of-the-art machine that compresses the mattresses and rolls them up into boxes, Sloom ships their products with courier services across South Africa – effortlessly and economically. The compression machine allows Sloom to reduce the volume of each mattress by up to 70% without compromising the foam integrity or damaging the mattress. The flagship mattress, which is packed in an easy-to-handle box, takes the hassle out of choosing a bed, as it allows customers to change the ﬁrmness level of their mattress in the comfort of their home. According to Kemp, Sloom Original is far superior to any other mattress in the same price range, because of its versatility. The four different customisable layers – firm, medium firm, medium, and soft – inside the mattress can be rearranged according to firmness preference. For example, those who prefer a soft comfort surface can place the foam layer marked as “soft” facing upwards. The sequence of the foam underneath is insignificant. Another advantage for Sloom customers is that the two sides of the Queen and King-sized Sloom mattresses can be split and flipped independently, so each person can choose their own level of comfort – eliminating arguments about which bed to choose. Sloom’s 100-night trial allows customers to test and determine whether the mattress is what they’re looking for. “We guarantee comfort and if a client is not satisfied within their 100-night trial, a free return and pick up will be arranged,” said Kemp. Sloom also offers a compatible Sloom base, and Sloom pillows made from premium memory foam chips for soft support in a luxurious knitted cover.